We have the perfect solution for your Christmas Parties and festive group meals at Lokanta. Our meze banquets are a selection of classics from our menu with some seasonal extras to offer a selection of delicious food. All the dishes are served at intervals around the table while you relax and enjoy your Christmas social occasion. Any group of four or more people can eat from these Christmas set menus during December. Simply let us know when booking that you would like the Christmas menu. Our main menu will also be available as usual to order on the day for smaller tables or to pre-order for groups. 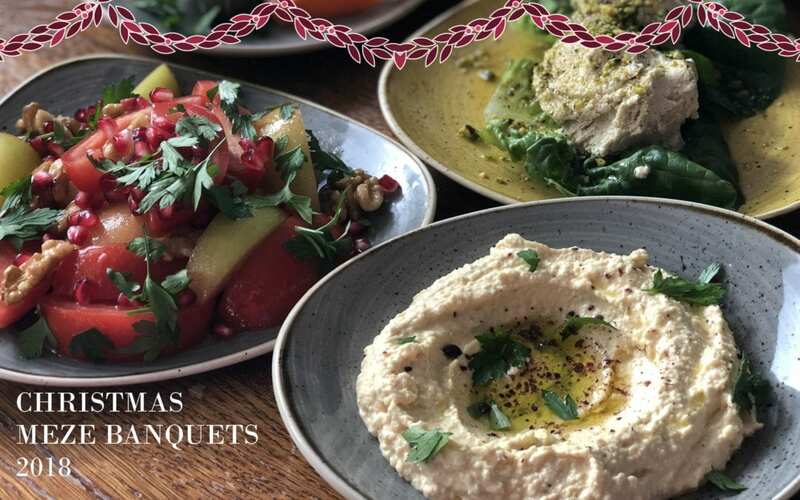 We have two festive banquet menus; mixed meze and all vegetarian. The Meze Banquet has been tried and tested over the years at Lokanta by many Christmas Parties. Our regular customers enjoy introducing their favourite dishes to friends. This set menu includes fourteen dishes as well as our delicious butter cooked rice and baskets of warm bread. The Vegetarian Meze Banquet is the same number of dishes but completely meat free. We can serve both menus to the same group as long as there are at least four people eating from each one. Favourites on the menu include our Turkish Salsa, a spicy fine cut salad of tomato, cumber, onion and peppers and Courgette Fritters which melt in the middle with creamy feta cheese. Absolutely everything on the menu is handmade by our Turkish chefs in the Lokanta kitchen. From hummus to baklava it is all made here in Broomhill. You may never have thought of Mediterranean style meze for your Christmas meal out in Sheffield. However it really is perfect for groups and offers a great alternative to the traditional Christmas meal. Turkish food, particularly meze, is making more and more of an appearance on British menus. So why not come and eat with the experts and try Turkish rather than turkey this Christmas! Please contact us now to book for December. We would love to have you for your festive celebration this year. If you have not eaten with us before this is the perfect chance to try a range of our dishes and we hope you will join us again through the next year.